We are pleased to be announcing to the second Nordic discus champion will be in Malmo first week of November 2011. Even now, Heiko Bleher, Francesco DeNitto, Jörg Stendker and Hudson Crizanto clear and more names will follow. Should make the journey,the last show was great. Just wanted an update on how things are progressing for the NDC 2011. Heiko Bleher, Francesco Denitto, Jeffrey Tan, Hudson Crizanto and Jörg Stendker will give lectures. they are celebration there 85 years birthday as an club, one of the oldest aquarium clubs in sweden. Already now more the 40 nanotanks in the competition. One cheeper alternativ are http://www.ibishotel.com/g​b/hotel-3332-ibis-malmo/in​dex.shtml But its about 3 km from the show. Class 1 - Solid Colour - Blue Diamond, Cobalt, Marlboro, Red Melon, Velvet Rouge, Yellow Diamond,Fire Red,Ocean Green, Red passion,Red Scarlet,White butterfly, Pigeon Silver. Class 3 - Patterned - Checkerboard, Checkerboard Turquoise, Pigeon Blood,Pigeon red, Pigeon Snake Skin,Pigeon Blue, Tiger Snake Skin, Tiger Turquise, Pigeon Panda, Red Maps. Class 4 - Spotted - Face Spotted, Leopard Snakeskin, Leopard, Penang Eruption, Super Eruption, Leopard eruption, Ring leopards, Red spotted green. Hmmm! Me no have discus now. Be gentile i am sensitve. in a near future,but i dont have that time i need for them at moment. Looking forward to seeing you soon Dude. 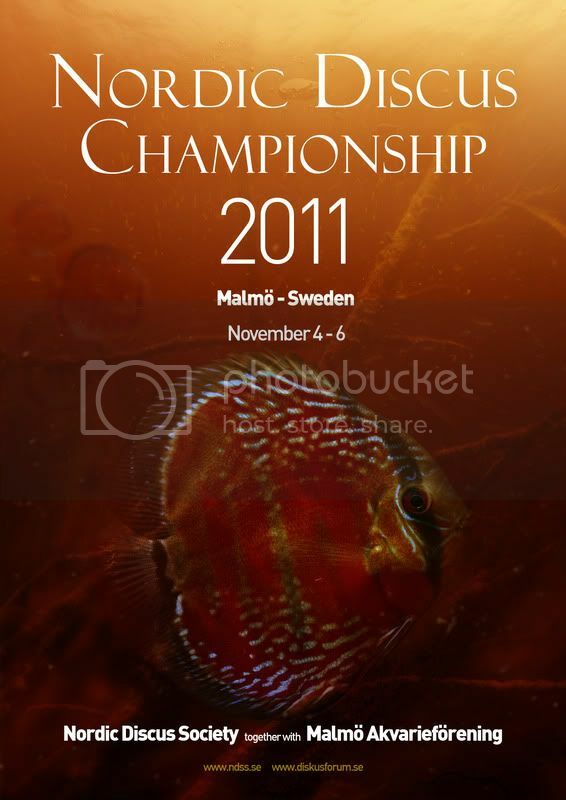 The NDS show was held with the Malmo Aquarium Society's 85th anniversary and was covered on Swedish TV.